Deck Solutions offer the best customized deck installation in Geneva by using only the highest quality of materials to build a dream deck that will last a lifetime. With a variety of composite and wood decking options, your deck installation in Geneva will turn out exactly how you want and the ease of mind knowing it was built by true craftsmen. If for any reason you have any questions or comments about a deck installation in Geneva, feel free to give us a call at 630-513-9411 or fill out the form to the right. 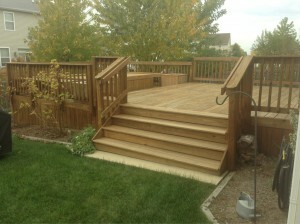 Deck Solutions has the options of pressure treated, cedar and hardwood for your deck installation in Geneva. All of these have their own unique attributes and advantages. When well treated, all of these options will last a lifetime with little to no maintenance based on your option. Our pressure treated wood is selected by hand to ensure only the best looking and straight boards are used on your deck installation in Geneva. Our cedar deck installation in Geneva option is a stainable, stable, durable and sound dampening choice that really adds a sense of style to your deck. Deck Solutions uses only the finest products available including, Trex, Fiberon, Timbertech and Azek. By using these products, Deck Solutions knows you deck installation in Geneva will last a lifetime because these products are backed by a lifetime warranty. All of these products have a natural look to them and have virtually no maintenance involved. These products will stand up to the elements after your deck installation in Geneva is completed. If for any reason you have any questions or comments about a deck installation in Geneva, feel free to fill out the form to the right or give us a call at 630-513-9411.